Anchoring is not permitted to interfere with the mooring fields but is permissible well outside the moorings area. Shroud Cay is an uninhabited archipelago of cays and rocks surrounding a shallow mangrove salina. It part of the Exuma Cays Land & Seas Park. There are no support facilities or services available in the at Hawksbill Cay other than moorings. ECLSP is a special place to cruisers; many return year after year. If you are a member of this group, you will want to do something extra to support the Park: Ways for cruisers to support Exuma Cays Land & Sea Park. Shroud Cay lies S of the BTC tower at Highbourne Cay. In Jan 2015, phone service was possible using a cellular signal amplifier and an elevated antenna. The Bahamas National Trust The BNT is mandated with the conservation of natural and historic resources of The Bahamas. ECLSP Headquarters monitors VHF Ch-16 and Ch-09 for emergencies. The Bahamas Defense Force maintains a presence in the area. They are located in the Park office building. ECLSP is a no take zone by land and sea. Fishing, lobstering, shelling and conching are prohibited in the area which extends from Wax Cay Cut in the N to Conch Cut in the S and includes 4 nm on each side of the cays. 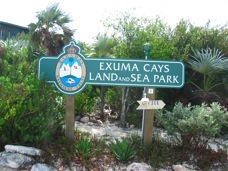 Exuma Cays Land and Sea Park is administered by the Bahamas National Trust. There is an on-site Park Administrator and Wardens who manage and patrol the park. Park headquarters is located on Warderick Wells Cay overlooking the northern anchorage. Contact on VHF Ch-09. Park office hours are: Monday - Saturday: 0900-1200 and 1300-1600. Sunday: 0900-1200. Moorings are available on a first-come, first-served basis. Mailboxes are located ashore for registration forms and mooring fee deposit envelopes. In Jan 2015, it was possible to get BTC cellular data service from the anchorage using a cellular signal amplifier and elevated antenna. Caution: Northern and southern shore waters are very shallow. Explore on a rising tide to avoid stranding. Caution: There are strong tidal currents in the cuts. Tides are about 20 min. before those in Nassau. There is no facility for trash disposal - take it with you. Park headquarters monitors VHF Ch-16 and Ch-09. Use VHF Ch-09 to communicate with the Park to keep Ch-16 open. Park headquarters monitors VHF Ch-09 after office hours for emergencies and mooring assignments for the current day only. There is no source of potable water available in the Park for cruisers. RO water is available for purchase at Highborne Cay, Compass Cay, Sampson Cay, and Staniel Cay.